This Clock Nightlight does double duty. Provides a nighttime glow in the kitchen, bath or bedroom. Plus the back-lit face lets you see the time easily. Compact size in durable plastic with reliable quartz movement. Uses 1 button cell battery (included). ETL approved. 3" dia. I love this clock in the bathroom. I use it all the time to keep me on time. I love this clock nightlight. I use it all the time to keep me on time. I got this to replace a similar nightlight clock I've had for about 10 years. The blue light of my old one seemed to be getting dimmer over time. Paragon is the only place to buy this product and I'm so glad I found it. The green light is quite bright and makes it very easy to see (and not bump into anything) in the middle of the night. It's also very helpful to have a convenient clock in the bathroom. 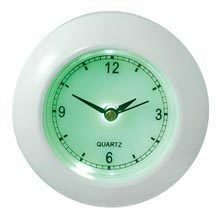 This is a replacement for a previous version of this clock nightlight. I use this in my bathroom so I can have a clock to watch the time as I get ready (which works better than my smartphone since it's visible constantly without unlocking my phone), and a nightlight. Having it plug in frees up my counter space. Paragon was the only site I could find this item. The last version was not quite as bright. This version is REALLY bright, so much so I have to close the door or it disrupts my sleep in the neighboring bedroom. Hence the 4 star instead of 5. I bought 2 since after years of service the background color eventually discolors. I had the last one for over 12 years. Definitely worth the $. Love the clocks. Perfect for a little light in the bathroom in the night and....it lets you know the time as a bonus! This is my second order. Purchased 1 about a year ago. It broke.. Had a hard time finding a replacement. This is perfect and doesn't take up any counter space. Hate how long it takes for an order to arrive from paragon. But since I have my clock again, I give it a 4 star rating. Hope this one doesn't break in a year. Ordered 2 extras this time. I bought this bath nightlight/clock long, long ago and the plastic cover had finally become clouded and it was time to replace. I was so pleased to find that Paragon had exactly what I wanted. It is a great product! Loved it - perfect for my bathroom! This item works great, I put it in the bathroom. Just enough light to see in the dark, and when you unplug it (to plug in your hair dryer), it still keeps time until you plug it back in (had battery). Love it and bought more!! 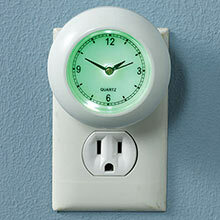 Handy small 3" diameter Nightlight Clock plugs into wall electric outlet and serves multiple purposes. This is nice little plug into an outlet combo clock & nightlight. The light is very bright green - actually a little too bright for me! Wish it were a softer white light. Great little combo for the bath! We like to carry a small night light on our trips so that if we get up in the night we're able to see, having a clock that's easy to set (for other time zones) is an added bonus. In the past we've used our cell phones which drains their batteries. This is much better and we're using it even at home. Love it. This is exactly what I wanted, a clock that's always lit for late-night bathroom trips. The weird thing is that the clock doesn't run off electricity, it runs off a battery -- it won't work without the battery. I suppose that's a backup in case the power goes off, but, one reason I got this was to not have another clock battery to fuss with. But, I'm happy to have a lighted clock in the bathroom that doesn't take up counter space. It is loud, but for me, it doesn't matter. If it's right next to your bed, it could be too loud. I had been looking for one like this and finally found it - love it. This small night light provides just the right amount of light plus it has the clock that makes it even better. Best thing I ever bought. I plug it in my bathroom and it keeps me on time for work. We have two of these for our two bathrooms. We've had them for maybe 15 years. We've replaced batteries from time to time. We're purchasing new ones and will offer our used ones to family members. It is a wonderful product.